Duchess Kate: Kate in Beulah London for Weekend in Bucklebury! Kate in Beulah London for Weekend in Bucklebury! We're back with a brief post as the Duchess of Cambridge features on the cover of German newspaper Bild today. Kate was photographed leaving local spar store Peach's in Bucklebury, Berkshire. The Duchess spent the weekend at the Middletons' Georgian mansion Bucklebury Manor. As we know Kate is incredibly close to her family and enjoys spending as much time as possible with them and they are obviously a very central part of George's upbringing. 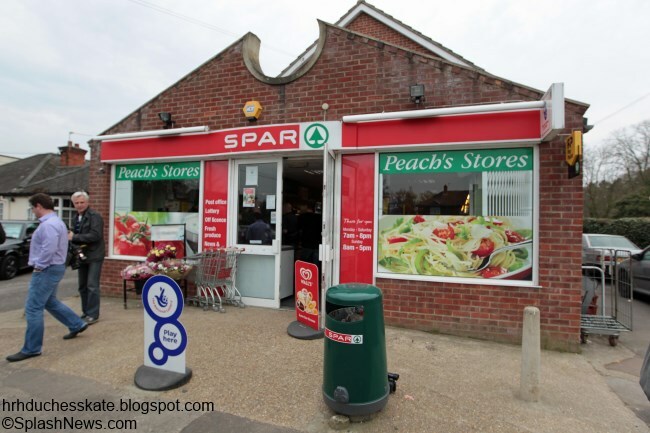 The owners of Peach's were invited to the royal wedding in 2011. Shopkeeper Hasmukh Shingadia revealed before the wedding Kate regularly pops in for her favourite Haribo sweets and William is partial to mint Vienetta ice cream: "We've really got to know Kate. She is caring and she is not like a celebrity". One excited onlooker spotted Kate, Pippa and Prince George in a traffic jam on the M4. She said Kate spotted her and waved: "She's stunning in real life". 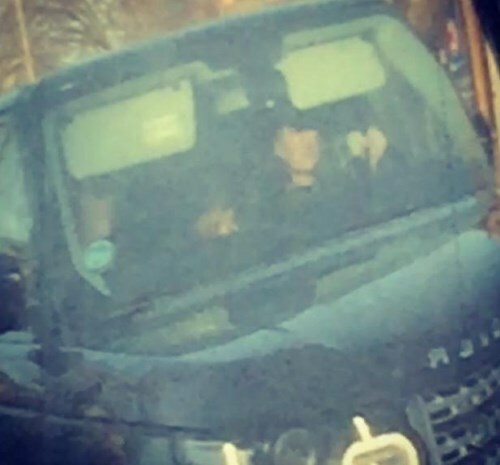 Below we see a very blurry pic taken by the royal fan (with many thanks to Ashley Marie). She also noted Prince William was travelling behind them in another vehicle. 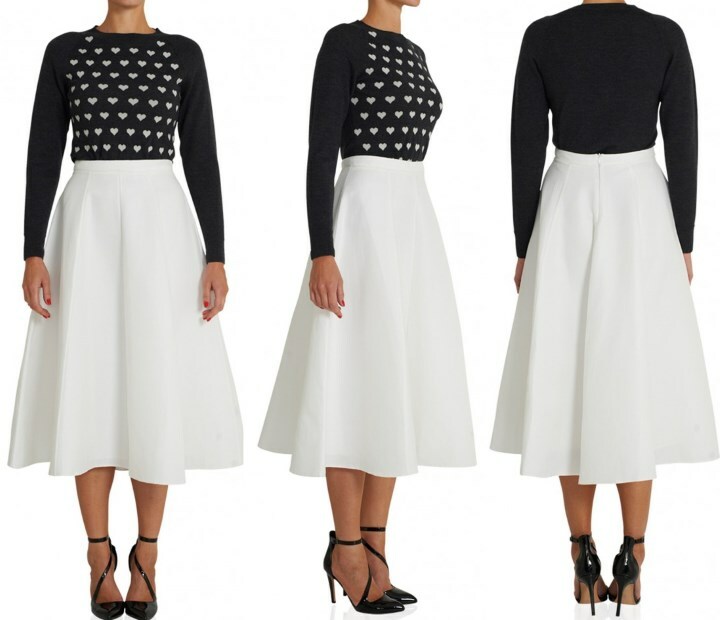 The Duchess looked stylish in Beulah London's 'Delaney' sweater. 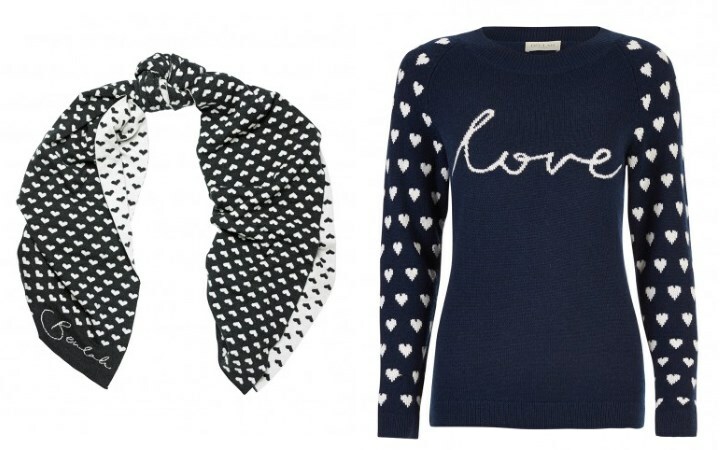 The cosy knit is adorned with the brand's signature white love hearts. It is described as a "front panel jacquard crew neck jumper". It was on sale in grey reduced from £250 to £125 before selling out. Beulah shared this snap on their instagram account several months ago. A perfect choice for a growing bump. James Middleton's girlfriend Donna Air also wore the popular garment. There are several other similar items on sale at Beulah London at the moment including the 'Twilight' sweater and 'Amala' scarf. Ohh i love Beulah London! I was reading the founder is Lady Natasha Rufus Isaacs aka Rupert Finch's wife. She's a beautiful woman and she looks like Kate! I love Kate's photos out and about, they show us "the real Kate" in her everyday life. She's a princess, but she's a woman just like us! Thank you Charlotte for your post, i love reading your blog and i'm starting posting comments now even if i've been reading you for a while.. English is not my first language, sorry for mistakes! I saw those tweets. The person also said that William followed behind in the next car. There was also discussion on Twitter that the fan was mistaken and that it was a protection officer beside Kate, not Pippa. I love this look, hopefully she will sport this later on as well. But where was William? No word about him?! I feel sorry for Kate, and other prominent figures, when they're photographed during normal everyday activities as opposed to official, public appearances. Everyone deserves to have a personal life. I would not be following Kate and George with a camera sand taking pictures of this type. I don't completely disagree but Kate knew what she was signing up for -- with almost ten years experience. When you choose a way of living, you accept the consequences and we all have good and bad parts to our situations. Other women may have loved their princes but decided the life wasn't for them. Kate made her choice and I don't feel sorry for her. I thought the same. But of course, we look at and analyse the photos just the same - we're part of the problem! This picture feels intrusive to me. And I do question the taking of photos on the motorway - even assuming the photographer wasn't the driver, and accepting that if they were in a traffic jam they'd be moving slowly, this seems an unnecessary distraction. With the exception of the Christmas W&K spent with the Middleton's, I think the residents of Bucklebury have been very respectful of the couple's privacy. Perhaps this felt particularly intrusive. I know I'm going to get a lot of hate for this, but my god how much time does Kate spend with her family? I'm never against grandparents spending time with their grandson or their own child, but if the rumors are true (which obviously a high chance they aren't), then the Middletons were at Anmer Hall from before Christmas to Kate's birthday. And then she just went and spent the weekend again with them. And now will probably be going to Mustique with them soon. I just don't know any other married women in their thirties who would want to spend so much time with their parents. And yes, I know, it's great that Kate has such a wonderful relationship with her parents. But every married woman I know, good relationship with their parents or not, wants to spend time in their own household, doing things with their friends, who are generally closer in age to them than their parents. I'm honestly curious if maybe I just have more independent friends than usual or something. And of course Kate should get to spend the holidays with her parents, but that's like three weeks with her parents, and then immediately another weekend. Whatever works for her is great, but it just strikes me as a little odd. But maybe I'm wrong. This interests me as well. I'm so glad kate is spending time with her family and she's able to remain close. Although, didn't she just renovate Kensington palace and anmer hall? If she spent time and MONEY on the renovations wouldn't she want to be there and not at her parents home in Bucklebury? I have to say that I agree. No hate from me. I don't understand it either. It's one thing to drop off the kid with the grandparents and take some time to go to the spa or have some time with one's spouse - that I understand. But spending days at end with one's parents and siblings.. I don't understand. She has a house in London yet she chooses to spend the weekend with her parents - why ? Unless the rumors are indeed true and William does spend inordinate amounts of time away from Kate and George. In which case perhaps rushing back to her parents to avoid loneliness might make slightly more sense. I have a feeling there are two things at play here. First, The Close Family Thing! I come from a very close, yet independent family on both my & my husband's side. All Drs, Lawyers, Government Officials in D.C., but we are together as much as possible. We spend Summers & Holidays at The Family Lake House, then also go away for an annual Ski Trip, Trips to The Shore, vacations abroad, & trips with our extended Families of a Cousins etc. We just all get along, the kids love their cousins & having your Best Friend be a Sister or Cousin, there's soooo much you Don't have to explain:) Second) I imagine it's very hard for someone in Kate's position to have/find Girlfriend's she can Trust? Just like Diana was so isolated & alone for those reasons, in contrast Kate has a Ready Made set of Friends she can Trust as well as have lots of fun! Her Family:) I'd also think her homes really could sometimes not feel completely like we find our homes, due to all the Help or Staff constantly around? Maybe being with her Family keeps her grounded & the same for a william too? My husband travels a lot for work. So I see my mom almost every weekend if not every other weekend to get help with the baby and run errands while I can. I understand she has help maybe she gives the nanny time off by going to her parents? And yes I do agree she spends A LOT of time with her parents if every report is true. Hi, Maggie! I totally agree with you. I love Kate and how she is so close with her family, i like the fact that the Middletons are so involved with the Royal Family. I have to say I don't like Carole Middleton. When i see photos of her i think of a social climber.. But i think her position with her daughter and grandson is important. I think Kate spends a lot of her time with her family which is a little bit weird for a woman in her thirties..
Kate has a nanny who has right to a certain amount of free time; she has only a housekeeper, which is not so much if you think how large are their houses and how much work is required (cleaning, washing, hovering, cleaning windows, carpets, dusting, making beds, cleaning shoes, ironing, cooking, taking care of Lupo, etc.) so I think that, if you want to keep a good level of tidiness, you need a lot of time, so Kate has to do many things for her own homework. Do you remember Downton Abbey, how many workers for a large house with a family of doing-nothing-at-all? And how you seem to detect her 'social climbing ways' from pictures of Carole is simply beyond me. Looking at pictures of her will tell you barely anything about her as a person - one way or another. I didn't consider the aspect of her not being able to trust many people. If that is why she spends so much time with her family, then that makes me sad. Every woman/person deserves friends their own age that they can trust and have fun with. William seems to have managed to make friends despite his very similar position. And I get that Kate may need the help of her parents, given that she is pregnant and has a toddler. But William is studying for exams. He should actually be home more now. And I highly doubt that his studying for exams is a 24/7 endeavor, or even close to that. Heck I'm in medical school, which is probably the most time-consuming/strenuous schooling you can get in the US, and I still have time to help my boyfriend around the apartment and spend time with him. I really don't mean that in a conceited way. Obviously everyone has to work hard regardless of their profession. But she also has a full-time nanny and a housekeeper at minimum. And I don't think we know that she only has a housekeeper. We only know about the additions to their household that they announce, and I highly doubt that they only have a housekeeper, given that they have two huge homes. I wouldn't begrudge Kate extra help - no one should have to keep up two 18+-room residences on their own or with just a housekeeper. That isn't realistic imo. Anyways, my point is simply that I can understand a very close family - but it's not even like Kate just spends major holidays with her families. She is with her parents all the time. Doesn't she want to establish her own household, now that she has two very large, very well-renovated homes? Lastly, I hope that William considered Kate's possible loneliness when he made the decision to be an air ambulance pilot. She already had to spend a lot of lonely hours in a secluded farmhouse in Wales while he worked for the RAF. Norfolk obviously is not nearly as secluded, but still, she will have to spend a lot of time without William over the next few years. I hope she does have friends, and doesn't have to rely on her family for friendship. Because mothers are wonderful, but it isn't healthy to not have friends your own age. I'm not saying she doesn't have friends - just responding to the possible hypothetical about that being why she spends so much time with her family. For those saying that being married to a future King is more stressful than most marriages - I don't necessarily know if I agree. Obviously Kate has stresses that the rest of us can never imagine, but we also have stresses that she can never imagine. She and William will never have to fight about money in the way that the general public does, because money (and therefore things like food, housing, and clothing) will never be a concern for them. She will always face more security threats than most of us, but she will also never have to worry about being sexually assaulted while walking down a secluded street at night. So yes, her life is not perfect, and she has to worry about things. But I don't know if her marriage requires any more work than anyone else's, especially given the leeway her and William have been given. Neither of them has a job right now. Sure, William is studying, but most men in their thirties who are studying without having a job have to stress about providing for their family. And the year before was William's "transitional year", during which he was neither studying nor working outside of royal appearances. So I'm not sure why their marriage requires more stress than anyone else's, when they have had more time than almost all other married couples in their thirties to spend with each other. Lastly (and sorry for my huge rants), I would like to say that I hate it when Carole Middleton is called a social climber. One - I think it's sexist when she is called a social climber and her husband isn't. I think it relies on sexist notions of women being manipulative. Secondly, it is also classist. What is wrong with wanting to make money and wanting your children to have money? Idealism aside, money is important. There is nothing wrong with ensuring that your children have financial security. For example, Kate has had a horrible pregnancy-related condition, and while I'm sure it was a terrible and terrifying experience for her, at least because of her money, Kate can always be assured that George will be taken care of by his nanny, and that she herself will be receiving the best treatment that exists for HG. Carole's daughter will never have to worry about affording food or housing. There's nothing wrong with a mother ensuring that for her child. Now I've obviously expressed concerns in the past about Carole allowing Kate to be too dependent and coddled, but that is a separate issue and has nothing to do with wanting security for her child. And there is also absolutely nothing wrong with Carole wanting to spend time with her grandson, and frankly, if Carole and Mike just want to spend time with Kate and William because Anmer Hall is luxurious and has a huge number of servants (not saying this is true), then that is absolutely okay too. Because who in their right mind wouldn't want to spend their sixties in a lavish, gorgeous home, with lots of servants to do all the work? Prince Charles gets to do that simply because he was lucky enough to be born into the Windsor family. Why shouldn't the Middletons get to do it too? They deserve it no less than Prince Charles, and actually probably deserve it more than him (or even Kate and William) given that they worked for their millions. Becca USA, that was lovely and I think Kate has that same connection you and your family have! Social climbing isn't about money, Maggie. It's about social status and in Britain, the class structure and entrée to a certain level isn't quite the same as the US. When Kate and Pippa were out and about in London, they were called the Wisteria SIsters. Because they were beautiful, fragrant, and ferocious climbers was what I was told the name stemmed from. When William and Kate became engaged it was reported (I read the article; I remember it clearly because I was stunned) that Carole's cell phone wallpaper was a photo of William. Not a photo of William and Kate, but William. I thought that very odd especially given how close Kate is to her family. My mother would be very proud if I walked away with Harry but I guarantee you I'd be in a photo on her cell! She'd be showing it to everyone yelling about how it's her daughter with Harry! None of that proves anything, but it is why I tend to believe the stories about Carole may have some merit. Here Here Maggie! I agree with most of what you said. As far as William and Kate's marriage being more stressful, I totally agree that theirs is no more stressful than a normal marriage. We will never know what they go through, just like they will never know what we go through. I will say the number 1 cause for divorce is finances. So, not having to worry about money is a big deal! Also, all that money provides, like vacations is another big deal. They are allowed to spend many vacations together as a family and also have lots of time at home together. A lot of families are lucky to find the money to go on one vacation. And half the time both parents have to work in order to provide for the family, so the kids hardly get the family time they deserve. I definitely don't think their marriage is any more stressful. Finances are a huge burden off their shoulders. As for the social climbing. I don't have a problem with them making money. I actually applaud Mike and Carol. I have way more respect for those who earn it rather than those who are just born into it like Kate. I actually think Carol deserves a lot more respect than she gets for working hard to provide a great lifestyle for her family! Hard work should be commended, not looked down upon. I wonder though if the 'social climbing' aspect comes not from making money, but rather from the way it seems that Carol pushed Kate to be with William. That is where I would say the 'social climbing' comes from. I know everyone thinks differently, but it does seem like Carol helped maneuver Kate into William's circle and tried to keep her there. It is like Carol was preparing Kate to marry into a title. Again, everyone has different opinions on this, but that is one strong theory :). Maggie, your comments are very thought-provoking, thank you for expanding on them and giving us a lot to chew over! My take is that a close family is a great thing to have; I actually feel sorry for people who don't have that experience. I agree with you that friends among peers are important, but I think they are not as necessary for mental health and happiness as you suggest, at least not to everyone. I have an adult family member who is quite physically disabled and has never had the experience of having a peer friend. Yet this person is one of the happiest people I have ever met and seems to have all social needs met through other family members. You just never know how things will be for anyone else, right? As for stresses in a marriage, your list was interesting and I agree that Kate's and William's marriage is probably not any more stressful than anybody else's, if you are comparing their marriage to another relatively healthy, loving relationship (obviously it is not as stressful as William's parents' marriage). I liked your list of the things Kate doesn't have to stress about. But we will never know what things actually do stress her. Everybody has something; we just can't know what she has that she struggles with, nor do we know what William struggles with--not saying that their marriage is in any trouble, just that all couples have things they have to work on and we'll never know what that means for William and Catherine. Here's hoping they overcome any trials they do encounter. I do so agree with you about it being both sexist and classist to call Carole Middleton a social climber. Not only that, it is the height of being illogically judgmental. How someone can think that of her based only on the "evidence" of public media is beyond me. Lastly, regarding this particular post of Charlotte's, I'm glad it was posted. I think it is okay to photograph a public person who is in a public space, within reason and showing a little restraint. I have to say I love the sweater. I may be closer to Carole's age than Kate's, but I like her taste! I'm not sure I would use social climbing as such because I try to treat all royal in-laws much the same but I do feel the Middletons are too often seen at royal affairs -- there needs to be more distance if they aren't going to be viewed someday as the power behind the throne when William is king. There is also starting to be too much contamination between Pippa and James and their not very edifying lives -- and Kate. It makes me concerned how George is being raised because, no I think the Middletons are loving, but they haven't done the best job parenting out there. Somehow the Middleton offspring, including Kate never really seem like fully fledged adults- they always seem to be clinging to mummy and daddy -- and I do find that disconcerting in a top member of the royal family, It's almost Peter Pan like -- they don't want to grow up. I'm not sure William really has the sense and knowledge to stand back and judge this. As for whether the queen approves or not, I hate to say it for I truly admire her but Andrew's recent actions show that good judgment isn't always out there -- and he is said to be her favourite son. As a parent of four children, I would not be so bold as to critique the parenting of others especially if the criticism is based on assumptions and/or perceptions, rather than an actual personal knowledge of the children and parents concerned. Also what works for some parent/children relationships is not necessary the same for others. I just wanted to comment that Kate's frequent family visits probably have nothing to do with any deficiencies on her part but more to do with giving Prince George true quality time with her family. Im sure Kate wants her child to not only know her family well but to be immersed in its culture. In my opinion, its a sad day when a young woman is criticized for spending too much time with her family whatever the reason. Many people would love to have such a close knit family. Leo, contamination is a really harsh word to use in that context. I would be completely unimpressed if Kate distanced herself and her children from her siblings. I think it has been difficult for Pippa and James to find there way since The Wedding because their position is so delicate now. They need to make a living but can't be seen as benefiting from their sister's relationship to the royal family. When Kate and William got married THERE WERE CELLPHONES WITH WALLPAPERS?? I definitely feel like Pippa and James get too much backlash for something that isn't their fault. Their sister happened to fall in love with a Prince, and while Kate gets a ton of unwanted attention from the press, at least she gets a lot of benefits too because of her position. Pippa and James, on the other hand, face most of the negative aspects of a royal life and none of the positive ones. And at least they are using their public nature for some worthy causes. I also agree that contamination is a harsh word, and seems incredibly classist. If the Royal Family wants to worry about contamination, maybe they should start with some of the Queen's children (and grandchildren), who have embarrassed the royal family much more than any of Kate's family. I do agree that the Middletons don't seem to have done a good job of raising independent children. Three children above the age of 25 and not one of them can live independently (financially speaking) from their parents, except for Kate, and only because of William's fortune. I will never agree with their decision to provide Kate with enough money so that she could basically not work, and be at William's beck and call to go clubbing and on vacation. But I think it's a bit harsh to say they are "contaminating" the royal family. The Middletons may lead to George being coddled and unable to be independent, but to be honest, who in the royal family isn't those things now? Prince Charles works a lot, but he also has an incredibly large staff and a very lavish lifestyle. Same with the Queen, although to a lesser extent. The Middletons may not be any better than the royal family in terms of keeping George grounded and independent, but I also don't think they can be any worse. And bluhare - this may be the first time ever that I disagree with you. I'm not sure I'm okay with using a newspaper report about Carole's cellphone wallpaper to determine whether or not she's anything. How do we know the report is true? Especially given the media's tendency to portray her as a "social climber." And sure, social climbing isn't about money, it's about social status. But let's not pretend like money doesn't have a huge role to play in determining social status. Sure, someone who has a high social status now may not have a lot of money. But they have that social status because at one point, their family DID have a lot of money. Additionally, what in the world is wrong with wanting to be part of the highest social status? Are people really saying that some people are just more worthy of that position than others? Because again - that's incredibly classist. Carole and Mike worked hard for their money. As a result, they could afford to put their daughters into situations where they were, I guess, mingling with people with a "higher" social status. As I've said many times, I don't agree entirely with the way they did this. But my issues with it have nothing to do with "social climbing." Because really, in my opinion, the real problem is not that Kate and Pippa worked so hard to be part of a group of people with higher social status. The real problem is that they had to work so hard. The real problem is that people made fun of their mother for being a former airline hostess, and that for some unbelievably arrogant reason, that made these people think that Kate and Pippa didn't deserve to be part of their higher social status group. And my mother gives me boy advice too. If I love a boy, she will help me nurture that relationship. Carole did no differently. The only difference is that my mother would not pretend like it's okay for me quit my job and give up my identity for a boy. But again, that's not about "social climbing." "Carole and Mike worked hard for their money. As a result, they could afford to put their daughters into situations where they were, I guess, mingling with people with a "higher" social status." And it's OK, good for them! But it's social climbing! Everybody wants to be part of a group of people with a higher social status but that's part of a definition, it's part of a social climbing. It's my opinion and you don't have to agree with me. I love Kate and i think she's a very lucky girl, I admire Carole Middleton too for working so hard but she's what I call a social climber. Good for her. I'm close to my family & lived at home longer than most would say that I should have. I live in the same city as my parents, but usually only see them once a week now. I'm not at all bothered about the amount of time the family spends together. It doesn't strike me as odd at all. I would also agree with the comments about Carole & don't think it has anything to do with sexism. I would think the same of a man doing the same thing. But more power to her. bluhare, what was the source of the story about William's picture on Carole's phone? I have never heard or read that before. Did it come from someone who knew her? Oh I didn't say that the Middletons haven't taken any flack from anyone, Maggie. Didn't say that at all. I also didn't say I know for a fact what goes on, but having read what I have read I'm sticking with my theory that there could be something to it for now. And I do think the cell wallpaper is telling. When the Middletons move back to the estate I'll start to think you might be right. Until then, I think there might be something to it. Favorite nonsensical point on this one is the articles that came out when Kate was pregnant with George about how he would be the first monarch with untitled grandparents in British history and perhaps they should be made Earl and Countess. :) Loved that one. I suggested Duke of Earl in the comments somewhere (not here) and people didn't find it funny. There are a lot more out there if you google it. You know what I find really odd - is the criticism of the Middletons for basically raising kids exactly like the royal family - who don't have jobs and aren't independent either. And just where do Charles, Anne, Andrew, and Edward get their money from? And please don't tell me they earn it going around and shaking people's hands and receiving gifts on behalf of their mother. I think Pippa and James worked at their mother's firm too - same type of hours and benefits. Moxie, from what I understand the Queen supports her family with money from the Duchy of Lancaster. I also understand that the royals have trusts they use. Princess Anne, for example, although she doesn't show it in her wardrobe, lives a very luxurious life and her husband earns a lot of money consulting or on corporate boards which I imagine he wouldn't have got if he weren't married to her. Since Tim Laurence retired from the Royal Navy as an Admiral with expertise in administration, I think he would have been offered these positions, but his standing is probably enhanced by being married to Princess Anne. Her main expenditures are probably for the paddock rather than the wardrobe! bluhare - and where did they get those trusts from? Their mother. We have a term for the Charles, Annes, Andrews, Edwards, Pippas, and Jameses of the world - Trust Fund babies. It's illogical to criticize Pippa and James for living the same lifestyle as their in-law's family - because if it is a character flaw for them -- it would be for the royal family as well. I'm always puzzled by the idea that to work as hard as you can until you die is the purpose of life. Kate is living the dream - does nothing, never has, never will. Kate is such an amazing woman, she's so lucky. I don't think her life is stressful. She's a future queen, she has lots of work to do, but her life will Never be as stressful as the life of most girls of the same age. She's a Royal, that's her status. I'm sorry. I don't like Carole Middleton. As someone said earlier she's a social climber. She worked hard to have lots of money but being a social climber isn't about money. I think Kate is really in love with William but what about "Wisteria sisters"? Carole wanted Her daughters to attend The best schools in order to spend time with people with an higher social status. It wasn't enough being Rich, she wanted a title. She has Not a sweet face as Kate. She has The face of a social climber, The one who start being snobbish with her own family just because "she's a royal". Again: Carole, Mike, Pippa and James ARE NOT ROYALS. Everybody talks about them and not about other in laws, i don't know why. Maybe because They're a little bit invasive? I like Kate but i don't like The Middletons. They're not Royal, They're Just like us. Even if they grew up their child in order to be NOT indipendent. That's not something to applaude. Not all from their mother; but I agree the Queen's the banker, Moxie. I have actually read the Newsweek piece in the past, bluhare, but I didn't notice the phone thing and actually it doesn't say that only William is in the wallpaper picture. Anyway, it's a bit of fluff like the toothpaste myth, and unlike the latter, there's no source. I've always thought some of these articles are interesting in that William's friends are said to be well trained not to talk to the media, and yet in an effort to provide evidence of sources, the "inner circle" are quoted continuously. Contradictory, don't you think. I know that some of the material in the article, and in others, has appeared elsewhere, some of it written by reputable reporters, but a lot is guesswork. There are facts we all know, such as Kate's background and education, but then there is the trivia that may or may not be factual. It was a nice engagement story, but I don't put complete faith in its accuracy. As I said when I posted the article, Anonymous, if you google it (as I did to get that link) you will find plenty that say Carole had William's photo. I found five or six on the first page. Whether they meet your exacting standards and provide citations is another matter. The Newsweek was more entertaining if nothing for what's come to pass and what hasn't. There's a vanity fair one written by Katie Nicholl too if you care to go search for it. Who really cares how much time Kate spends with her family? They obviously enjoy each others company, and I'm sure George is a huge draw for the grandparents. It has often been said that the members of the Royal Family never read articles about themselves, which I have never understood – until today, because if I increasingly feel angry while reading your posts, I wonder what Kate would feel. Honestly, I am quite shocked by so many Kate-fans bluntly crossing a line. Let’s face it: How would you feel if somebody who does not know you personally comments on your private life? And from what I have just read here these are not only comments but rather insults. Do you people do that on purpose just because you are so miserable or do you really not realise how despicable some posts are? How would you feel if someone insulted your mother, your siblings, all the people you love the most in the world? How would Kate feel if she read what you write? Or Carole? Or Michael? Why on earth do you feel you have the right to condemn Carole Middleton? She appears to be a clever woman, she works hard, seems to be a loving wife, mother and grandmother – and she is really beautiful. Yes, she wants to get the most and best for her children and herself. So what? Where is the difference to you and your lives? Let me have a guess: She has achieved everything she wanted – and please do not tell me you would not do the same if you were in her position. Her life is a success story. She has the brains and the looks a modern woman today should have, and thus she is a great role model. And she seems to be very happy with her life and I congratulate her on that. Sorry if my post offends anyone, it might be too emotional, but some of the posts I have just read really hurt me while reading. I'm sorry, Marion, but i don't think expressing your opinion is offending. Someone used offending words? I don't think so. First of all: I like to think that if someone uses offending words Charlotte would not post the comment. Then, the only expression I used is "social climber" which is not offending (that's my opinion, you don't have to agree with me). I explained why i don't like the Middletons, but i don't think i was offending someone. Again: i suppose Charlotte would not post the comment. I like Kate and i admire her, i love her, she's such a role model. But even if i love Kate, i think i don't have to approve everything she does (and i was not talking about Kate but her family). I don't think i was offending someone but, again, you don't have to agree with me. That's my opinion. Marion, I too believe the Middleton's do not deserve the criticism directed at them. And I'm not sure how the term "social climbers" could be perceived as anything but negative. I honestly don't. And referring to it as an "opinion" doesn't make it any kinder. The Middleton's are a close, loving family and the fact that their adult children, and son-in-law, enjoy spending time with them is proof that they did something right. If I were in Kate's shoes, I would be hurt, very hurt in fact, if I kept reading some of the negative comments. And I also don't have an issue with Carole (reportedly) closing ranks and distancing herself from potentially untrustworthy relatives who may have poor judgment or who would attempt to profit from the family's connection to the RF. A mama bear should protect her cubs, no? I give Carole credit for putting her immediate family first. And while some people like to argue that Kate knew what she was getting into, the only thing the Middleton's are guilty of is having a daughter who fell in love with a future king. Then consider me unkind, royalfan, because I do believe Carole Middleton has social aspirations. bluhare, I apologize if I offended you. It was certainly not my intent. I was responding to a rather lengthy conversation here. Most people do strive to do better (a better education...working hard...etc). Carole is no different and there's nothing wrong with that. She has brains and she worked hard to give her family a better life. Kudos to her for that. But the term social climber has a negative connotation which doesn't give her credit for brains and hard work. The term dismisses what should be seen as a good quality in this day and age. This blog is a balanced and thoughtful place to visit. Please do not attack our hostess and administrator. There are plenty of places to visit in the virtual world you might be better satisfied where negative opinion reside. Oh my goodness! :0 This is why I followed Charlotte's Blog for so long but never posted, because of all the negative twists off topic that things would take. I know it's hard to communicate as well online as one can face to face, but I wish everyone, especially on This lovely Blog, could just pause a beat & give one another a break...... Instead of jumping to conclusions & jumping down one another's throat? Charlotte does an Amazing Job with This Blog & She Deserves Our Respect & Courtesy Most of All:) Unless Charlotte "Says" that something has changed in W&K's Status, why don't we just read what she reports for us & not extrapolate? If one of us is confused with a post, let's just be real & ask.... am I understanding you to say????? As far as W&K go... They will increasingly not be joined at the hip. Life gets busy & they will increasingly be busy & we don't know what goes on in their private life, soooo I'm going to continue to remember that not seeing them together can mean nothing, just like holding hands & smiling can mean nothing too! How many times have we had a spat with our spouse & quick turn on the smiles etc. I just think micro analyzing leads to nothing good...... ie accusing Charlotte of saying something she did not say. But..... This is all just the way I see it. Thanks again Charlotte for all your hard work! OMG Anon 20:16, this is an uncalled for attack on Charlotte's integrity. I too saw the tweet that William was following in the car behind, but to conclude that omitting to mention it in a blog indicates William is not part of Kate's life is a bit of a stretch. I don't know, but you may be the same Anonymous who constantly comments and speculates on other sites that William is unfaithful to Kate. The woman that I saw in pictures yesterday, comes across as happy, finally enjoying her pregnancy and secure in her happiness. i think the sweater is fantastic, especially for an expecting mom. 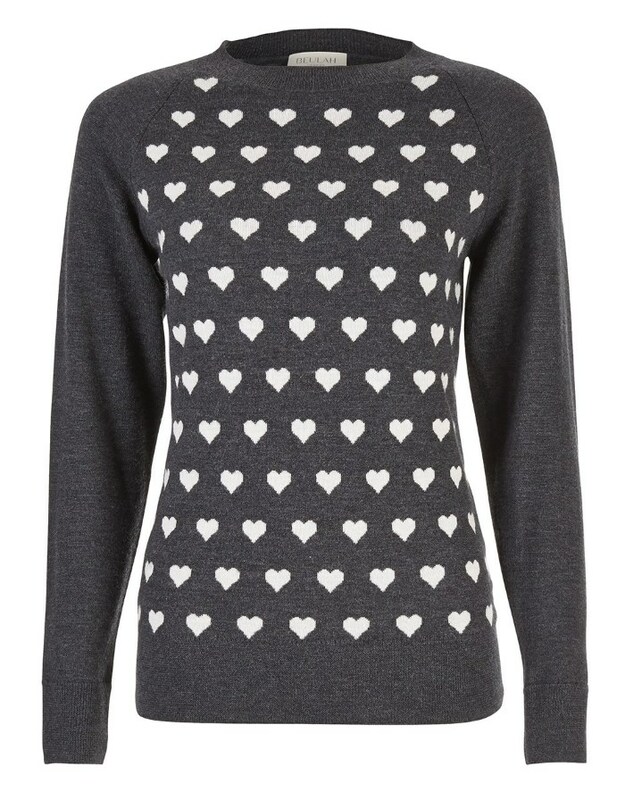 in fact, the other sweater with the hearts on the sleeve is amazing, too. i lived down the street from my family until about a year ago and we were together ALL THE TIME. yes, it can sometimes get tricky with everyone and their varying opinions, but overall, it makes for a very strong and loving support system you can always count in. i see nothing wrong with it, as long as Kate and William BOTH enjoy the time, and it seems they do. she has close-aged siblings, which is fantastic for everyone. i imagine its gotten a bit tricky to trust people who are outside of the family, so i'm glad she has them for support. it seems like a bit of a change from what the expectations WERE back in diana's time and don't we all hope this goes much better? if she never saw her family, wouldn't people be saying what awful family values she has? give them a break. MORE families should be like this! I'm definitely thrilled for Kate that she has a very supportive family and is able to spend time with them without facing backlash from the royal family. And absolutely yes, her family situation is so much more preferable than Diana's was. That being said, it's not like the alternative to Kate (maybe) spending too much time with her family is to spend no time with them at all. I don't agree with either extreme. I don't even know if I think that Kate's situation IS an extreme. But anyways, I just don't think it makes sense to compare this to Diana, because again, the alternative to Kate's relationship with her family is not Diana's relationship with her family. If I lived in the same town as my mother, I'd be with her every day. I'm personally glad that for Kate the human person, that she has a loving supportive relationship with her family, and that her husband is supportive of her continued relationship with them. They are her family, and they have helped her and loved her throughout her life (regardless of what her life has been or will be) and she shouldn't be judged or marked for liking spending time with her mother, her father, her sister, or her brother. Good on her, I say. We hardly ever see kate in public. I think it is nice every now and then to see her out and about! If people are going to be so negative, then why do you feel the urge to follow this blog? Thank you Charlotte again for the post!! like a marriage we may experience or expect. A good foundation in a family can only add support and a safe haven. Especially in these times of increased security. They have to find a way to function as normally as possible for the sake of their young family. I am sure her family supply this for both. Not a sweater I would ever pick to wear, but maybe it's an age thing (I'm old enough to be Kate's Great-grandma) -- it looks passable untucked - but I really think it looks sill tucked in. Kind of a throw back to something in the 80s - reminds me of those 'cutesie' Scotty dog and other theme sweaters popular them. I don't think it's fair to have this kind of pictures published, because even royals should be allowed to have some privacy. However, I do think Kate looks really cute with this sweater. I'd wear it and I just turned 20. So it's younger than her 'job' clothes which I think are usually great and appropriate. She's such a classy woman, she deserves to have some bad days and some off days too. Nobody looks that great all the time,I like this side of Kate, shows us that she's still human. She gets so much hate these days, that it's insane. She's not our personal Barbie doll. I think it is wonderful that William and Kate spend their time hanging out with family. Look at Prince Andrew and the debauched crowd he socializes with. Will and Kate seem to me to be wholesome and behaving like proper heirs to the throne. Yes, they enjoy their money, but in a healthy way. They go to Mustique -- but on a family vacation -- not with scummy jetsetters. As for printing candid shots, I think it is perfectly fine! Really, Kate is not harassed every time she walks out the door. There have been months with no photos of her whatsoever. In her position, I think the occasional candid is not so much to put up with -- plus, I enjoy seeing them!! The only face I can make out in the blurry photo of a vehicle seems to be male, probably a protection officer. Also, it appears that the photo has been reversed; see the letters visible on the front of the car. I am not at all sure this picture is useful. It was nice the fan to tried to take it, but perhaps it should have remained private. 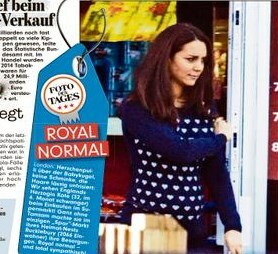 The Bild photo shows Kate rather charmingly, but probably not especially happy with the presence of paps where she has usually had privacy. I do like the sweater. It seems questionable to me whether the Middletons spent the whole time between Christmas and Kate's birthday at Anmer Hall, since they are busy people. In addition, they have a large and no doubt well staffed home of their own, so luxury is not an issue. The fact that they were seen at church in Sandringham at Christmas is about all we know! Sometimes I think that what little we know about our favorite, or unfavorite, public figures encourages fantasy, both good and bad. Apparently we have few fantasies about the Cambridges spending weekends with the Waleses, which no doubt they sometimes do. A sense of reality would be a good thing. The reversed photo must have been taken via a rear view mirror. No wonder it's blurry! That would make the visible face the driver, who doesn't look like Kate. The more I look at it, the more I think Kate is visible with her head down and her hands in front of her face, on the left side of the car, which becomes the passenger side when the picture is reversed. It does not look as if she was so happy to be identified and photographed on the motorway. I completely agree with you CuriousKat. Charlotte please carry on your wonderful work. Thanks. I don't get why some overreact over the fact that the pic of her at a grocery store got posted, when lots of pages and magazines published the pics of her at John Lewis. The only difference was that one was in London and the other one in her hometown. Does it make a difference because she was "dressed up" at John Lewis like she expected to be seen? I really don't get it. Not to me. I didn't think those photos served any purpose, either. Kate shops. So does everyone else. Another example of unnecessary hounding by photographers. I love Kate and i think her life is stressful - she's a future queen! but how can we say her life is more stressful the ours? She has a lot of help, money, houses, a lovely family, her position requires a lot of work but she has lots of comforts that most women in their thirties can only imagine..
disparities of material wealth do not take into account the obligations that come with it. Out of curiosity, what decisions will William make that will affect many? He is obliged to entertain statesman when they come to visit - and go to their countries and be entertained by them. But I don't think the world is actually depending on William to run it. William is in line to be head of state, which entails advising and warning prime ministers and other government officials, reading and signing state documents including laws, asking the head of an elected party to form a government, visiting his/her realms and other countries. In the current reign it also includes acting as head of the Commonwealth, and head of state of various countries which include Australia, New Zealand, and Canada. (Governors general act on behalf of the monarch in those countries unless the monarch is present, but I'm not sure whether they perform all of the monarch's state duties.) The monarch has little power but much responsibility, including ceremonial functions. The decisions that would affect many are those that are involved in government, where the monarch still has a role to perform. But the influence of Queen Elizabeth II is felt far beyond her realms. I am old enough to remember her entire reign, and as a citizen of a British ally, I feel that she has contributed a great deal to the tenor of her era. I'm sure British posters can correct and elaborate on this summary. Well, Anonymous, maybe someone should tell him - because right now he is out training to be a helicopter pilot rather then paying attention to the world. I think the right to advise and warn is just as ceremonial as the rest of his duties - and that folks who actually go to university and study foreign policy and economics and are voted in by the people are actually running the UK. Maybe someone in the UK can comment on that. I neglected to add that the monarch is also head of the military and head of the church. She appoints the archbishops. The monarch is more of the face of the country, but doesn't really have any power. William will not have any decisions that affect many. It is surprising how little say the Queen really has. Hence why so many people believe a monarchy is outdated. Thank you Annon 19:05 I didn't think I had to spell it out, but you did beautifully. When I said many, i did not mean the world. It will be a different realm for William and Kate as Europe is changing based on decisions made by past and current politicians. The younger generation seems to have a different perspective on all things royal than the Queens generation. That alone will be a challenge for them. If there were no decisions for monarchs there would be no need for a court, the past situation in Ireland is a prime example. I appreciate that Charlotte shares that there is content about Kate circulating - whether it comes from twitter, instagram, facebook, tabloid, respectable paper or magazine, a charity, a business, the government, the palace press office, or the royal family itself. To not have reported on it would have been a lapse in the quality of her reporting. The blog title is Following the Life and Style of the Duchess of Cambridge - and paparazzi are a part of that life. I want to point out that she provided us with a screen shot of the tabloid and not a link to financial support the tabloid and photographer. She remained neutral and reported the facts. She even put up a blurry picture from an excited fan in which no one is recognizable - just so we knew the content was out there. We are all, of course, here on our own free will (except for bluhare who I think is serving time in a minimum security prison and using the prison library) but I want to encourage everyone to make the distinction between knowing that information is being circulated - and condoning or promoting pap behavior. Moxie, that is the first time in blog history I have literally laughed out loud. That was so good I don't even have a wise acre response! Moxie, thanks for the laugh too. From what I understand and I am truly no expert, people in the public out out in public are open to photographers, whether it's a passerby with a cell phone or an unwanted photographer. Many a photo have been 'published' via Twitter, FB etc. It's not like the photos were taken through her window at her home. I am sorry to say but she is a public figure - despite all the cries for privacy. I do not think there is anything wrong with Charlotte posting magazine photos of the Duchess. Charlotte is doing an amazing job and it's a royal treat to visit this site. :) I personally don't care what our Duchess wears, I just enjoy the photos and Charlotte's anecdotes and commentary. Cheers. Thank you very much Deanne! I agree with everything you said about these photos of Kate, Deanne. Thank you very much Deanne! you are correct. I enjoy the photos, anecdotes, commentary and just everything Kate. I like the respectfulness of this blog in general. I'm glad Kate is able to see her family and have more of a normal life. Too bad they didn't allow the same for Diana. I do love her sweater. Thanks for the great post Charlotte. This comment doesn't have anything to do with this particular post, but is something I'm interested in. I saw on another site that the Cambridges received over 1000 gifts on their NZ/Australia tour, including several pieces of jewelry for Kate. Charlotte, I'd love to see a post on the jewelry gifts (or other gifts) that Kate received throughout the year. I would also like to thank Charlotte for her great blog, her research, and the fact that she lets us say what we feel about the Duchess, without being offensive, of course. It seems to me, the faithful followers of this blog all appreciate the Duchess and are delighted for her when all goes well, but we are also entitled to sometimes feel a bit frustrated. It goes with the position of future Queen ! I also find the Middletons spend a lot of time together. Really a lot. The Peter Pan idea someone talked about seems quite true, in a way. Her life is much less stressful than for the vast majority, of course. She has had time to adjust to the public and I am sure the perks of her life outweigh the cons. In my opinion, the Duchess hasn't really spread her wings yet, even if she does do her homework on her charities. She is beautiful and caring but doesn't give out that more modern vibe that Princess Mary, Queen Maxima or Queen Letizia have been giving out for years now, rejuvenating the European monarchies. And please don't say it is because she had a child and is expecting another. All these ladies have done the same. Maybe it is to do with the fact that we are in England and the monarchy works differently. I expect the Diana disaster frightened the Queen and Prince William, which we all understand. It is just a pity not to hear her more express herself as a woman. I find if interesting to see how all these monarchies go forward into the XXI st century. Kate is neither a crown princess nor a queen, yet. The others have been and are. Different kettle of fish! Once she becomes Princess of Wales and Queen Consort, I am sure a switch will flick just like that. She doesn't need a lot of practice right now. We are guaranteed many many years with the Queen and then Charles before Will and Kate need to worry about preparing for their future roles. They are listening to the Queen and her wishes. This is what she wants right now I am certain. I agree with you Theresa. Kate has not yet found her voice and because of that is not yet impressive nor a role model. I agree with Anon, Becca and Stephanie that she has time still, but I hope that she will stand up for a cause or a charity or something that is more than what she is doing now. I fully agree with your post! 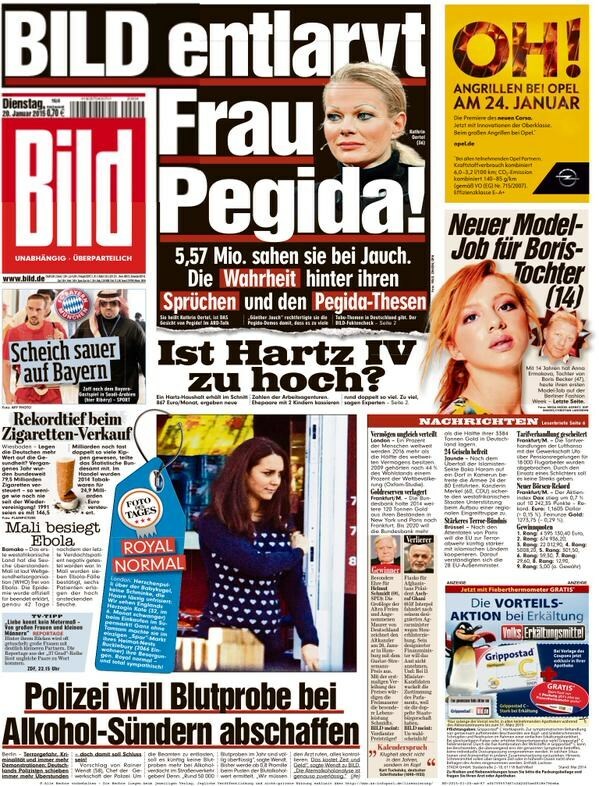 In Germany, you wouldn't call Bild a newspaper. It's a tabloid. Yes, that´s what it is - and one you don´t have to read. No, you just shouldn´t. I really enjoy your blog and one of the things I like about it is that you are respectful and not snarky or critical about kate. However - for me I won't keep reading if it contains paparazzi pictures because then I feel like I am part of the problem gawking at these people in their private life. I'm one of the people who think we should have learned lessons from Diana's death. For every picture we see of kate off-duty - know that she is being hounded by camera people as she just tries to live a normal life. Those photographers make money off of her misery and if I buy the magazine (which I haven't in maybe 15 years) I'm part of the problem. It's the same with blogs. I won't be one of the people consuming this stuff and adding to the problem. Kate should be able to go to any store - fancy London story or this little store in Buckleberry without being hounded. We don't need to see these pics. They are already devoting their entire lives to this (with no hope of retirement!) - why make it more difficult by hounding them in their "off duty" time. Everyone wants the royal family to be "in touch" - well if they can't just go to a store without being hounded - then how can they live a normal life? I'd love a paparazzi-free Kate blog. Certainly, Catherine will have more children. (I will be more surprised that she stops after the second one is born.) In a way, she needs to have more children because in the future, assume they do become King and Queen one day, they will need help with the thousands of Royal engagements. By then, even the Princess Royal, Sophie, etc. won't be around to fill in those gaps, for example. Prince Harry and his "future wife" will be helping William and Catherine when that day comes. You can all do the math. We can criticize Catherine all we want, but in reality, she has some duties to fill now and that's growing a family. She does not need to "work" because as many had said she is not a "full time Royal". (And I'm sure Prince William would prefer she just stay at home and enjoy the perks. It is what it is. The funds come from Prince Charles anyway, so no great financial burden from William. He will inherit that money one day. Imagine that.) After the second one is born, there will be a third and perhaps, a fourth before Catherine turns 40 years old. By then, in perspective, the Queen will be 95 years old (God bless her). I don't see why everyone is overreacting about this ONE photo. It is not like Kate is photographed everywhere she goes. For how often Kate is spotted out and about shopping or what not, there are hardly any photos. For probably every 10-15 trips she takes, maybe once she is photographed. I think she already gets the special treatment. No other celebrity is allowed this leniency. The only reason she is not photographed more is because of Diana and William. The paps are actually pretty respectful when it comes to Kate. So, in regards to the occasional photo being taken, I don't really feel any pity for her. She gets plenty of 'normal' time. This post's discussion has been especially interesting. Thank you everyone for contributing, and of course, thank you, Charlotte, for providing us with the material! The paps are a problem. But with all the tech changes since Diana's death it seems impossible to ensure that kind of privacy, short of an invisibility cloak. This might sound blasphemous but William and Kate could retire. Sure it'd cause a stir if they unsubscribe from the monarchy listserv, but the monarchy survives on the premise that the next in line is just as qualified. If they weren't then you get into the idea whether having a ceremonial leader based on lineage and not skill makes any sense. But the UK seems to react to the royal family with heart not head. Otherwise why would the citizens want to bother an inbred family that grooms volunteers? I'd like to live in a world where skill and competence matter more than birthright. Kate's outfits are great -- that's why I read the blog -- but I think the service they offer their country is negated by the outdated principle that got them there. Early reports are claiming William, Kate and George arrived in Mustique today for their annual holiday with the Middletons! Hahaha they are so predictable;) I hope they gonna have a lovely family time together though. Oh I'm So Glad William Joined Them:) Let's face it guys, (I've been thinking on this, as I was finishing up some research & all this Great Discussion these last days popped into my head) but I get the vibe that William is at Best a Reluctant Heir.... & with the Historical References to how The Queen's Uncle Edward's Abdication effected her & the view she held to as to how it effected her Father's Health, Coupled with The Whole C&D Debacle & of course Diana's Death..... My hunch is that Kate's Job is to Love & Provide Moral & Emotional Support to Two Future Kings. Pretty Big Job I'd say? I re watched "The King's Speech" the other night with my Mom, who was visiting,.... & was Struck again by the Emense Loving Support The Queen Mother provided to Queen Elizabeth's Father! If we realize that was a wonderful relationship that molded The Queen, we may better understand what she may be helping to cultivate for William & little George? Thank you Charlotte for sharing this news.You continue to report with restraint and good taste. I'm hoping the family will enjoy their time together. I'm happy for them. 1. I don't think people are upset that Kate spends so much time with her family. I think the big criticism is because she goes to the Middleton house instead of having them over. Kate's residences have built-in security measures (for example, palace gates etc) that are superior to the Middleton's "normal" home. Therefore, when she goes to their home, more security guards are required, which is a direct cost from taxpayers. Her family could come visit her in one of her many lavish homes, but she goes there, causing greater financial strain on the subjects. At least, this is what I have researched and been told? 2. It is not that the Middletons have become financially successful that people call them social climbers. It is not to do with money. It is because at social events, if someone is not high society enough, they will not give them the time of day. This behaviour has been documented in the press, even by respected royal reporters, for about a decade now. I am trying to find one particular article in which the author detailed this behaviour upon meeting Carole at a social event. The article includes a photo of him with her. He certainly did not hold back. Basically, it is not about their financial success, it is about them only wanting anything to do with people of status, and that those who do not have admirable social status are considered beneath them. This includes some of their relatives. This is one of many reasons they are not considered down to earth, normal, kind, friendly, and warm people. Additionally, people do remember that William cheated on Kate a number of times throughout their courtship, also reported by respected journals and royal reporters. Instead of encouraging their daughter to understand that she deserves better treatment, they clearly supported her taking William back every single time. Social status in particular is very, very important to the Middletons. I totally agree with you. That's why I don't like Carole and The Middletons. It was reported Carole was snobbish with her own family just because she's a royal (and she's not!). Well said, Stephanie. I remember the exact article you mentioned - but surprisingly, I can't find any trace of it online, either. It was well documented at the time that after the 2007 breakup, William was seen drunk at a bar dancing on a table and shouting "I'm free". If that were my daughter he was dating, I'd have a very difficult time accepting him back into the fold, Prince or not. Sorry for the double post - but I think I found your article, Stephanie. It was part of an article about Pippa's book. Dad Michael, 63, guards the bar, stolidly drinking red wine. Mum Carole, 55, works the room like a pro, matching her husband glass for glass. She wanders over to the corner of the bar to pet a spaniel puppy. As far as I have read the Middletons are hard working people just trying to malke a living. And enjoy life with their children and their families. We have no idea what goes on but you all seem to think you do. You all need to stand back and let them have their life and families. So if you are not from the UK where you pay high taxes for their security team then you really have nothing to say about what they do or not do. This blog is a "fan" blog, we should not worry about where, when and how many times they go on vacation or do whatever families do. Yes it is a fan blog for Kate; I do not have to be a fan of her parents. "I am sorry but I can not understand why you all have to put the Middleton's down. We all have no idea much about them except the crap that is writen in the media." ... It's as though you didn't read a single thing we wrote. If it's true, I hope they have a lovely family vacation in the sun! I hope they have a wonderful and relaxing vacation! Glad they get to spend the time together as a family. Could be their last vacation as a family of 3. :) Happy 60th birthday to Carole Middleton! Enjoy! I support their right to go away on vacation - who does not if they can. Emma Watson has never really stood out as being exceptionally talented or exceptional in anything, really. Yet, she is out there giving such important speeches, raising the word and taking up such an important cause, when she could have been back in Hollywood working on yet more insignificant movies. And that is a good speech - she comes up with concrete action items. She knows how to throw her voice, use emphasis and the goal is to inspire action. Far cry from the damp squib one-paragraphers Kate struggles to deliver. I know that there are ready excuses available : she is not crown princess, she has a family, yada yada.. still it is regrettable that Kate has been so miserly in her attentions to the rest of the world. She has such a platform yet she is so uninterested. And also, uninteresting, I suspect. Another year, another vacation in Mustique. Do the Middletons truly have no interest in the rest of the world beyond their upper class bretheren? Have they been to any other country? Do they not have any curiousity ? No wonder we see nothing else from Kate. Well, I see your point. (But you must not have grown up with Harry Potter. Emma Watson has extreme movie-star status in my generation). But that is her choice. Not everyone wants to take on causes or feels that drive to do it. Some do, and that is amazing, but I don't think it should be a requirement to being a good person. I know some people can get mad at a gay person for not "standing up for the gay agenda". And I feel that is wrong. That person is gay, which means no more or less in the want to drive a revolution. You must have it in you, and I don't see it as ugly not having it in you. You probably have other good qualities. Also, why is it wrong being content? (This is pointing to your Mustique comment). Not everyone need to have a want to travel the world around. Some do, some don't. Neither is better than the other. I think the middle tons choose mustique because it is a privately owned island and paparazzi are forbidden I'm sure most of us would love the company of a loving supportive family and i admire the middle tons for having this closeness with their children. Plus the business was made from scratch and hard work, self made. Emma Watson suprised me too. She clearly has a voice, sometimes strong, something shaky but everybody got the message. Someone to look up to no doubt. Your last paragraph made me think, the whole family is addicted to the same things. Really interesting why they do not choose a different destination especially when they are so well off. Moreover they are often critised for having so many vacations. Sorry I disagree with almost all of you. When I was a young mother and pregnant with my second child, I turned to my my Mother for advice and comfort every chance I got. True I wasn't in Kate's physical shape, nor did I have paparazzi stalking my every move, but I needed and wanted every bit of love and comfort I could get from her. I think this is a simple need of the moment as she feels her way into this new phase of her life, both public and private. As she feels a little better, physically I'm sure she'll settle in, but we always need our Mothers. I think you all would be glad she came from such a close family.